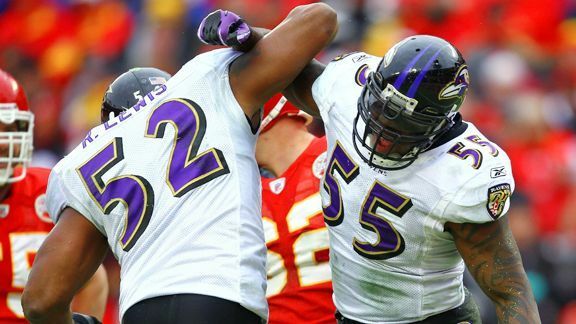 Ray Lewis (left) and Terrell Suggs (right) lead a Ravens defense that has allowed the lowest Total QBR in the league. Total QBR has allowed us to evaluate quarterbacks through the first half of the NFL season and, by extension, the play of the offense as a whole. But it also offers us insight into the effectiveness of defenses in limiting the Total QBR of opposing quarterbacks. The Baltimore Ravens lead the NFL with a Total QBR allowed of 23.3. The Ravens defense is even more intimidating when they pressure a quarterback, allowing a QBR of just 0.4. In these schemes, they excel at forcing bad throws, forcing fumbles, sacking the quarterback and not letting the quarterback scramble. The Detroit Lions, New York Jets, and Kansas City Chiefs are among the best coverage teams in the league. While the Lions and Jets are known for pass defense, the Chiefs have largely flown under the radar this season. Kansas City pressures the quarterback on just 19 percent of plays, the lowest rate in the league. But the Chiefs excel in coverage when not getting pressure, allowing just a QBR of 58.3 in those situations. They use a three-or-four man rush as much as any team in the NFL, so their defensive backs have pretty consistent coverage responsibilities. There is a huge variation across the four teams that generate the most pressure on quarterbacks. The San Francisco 49ers and New York Giants have succeeded when bringing pressure, while the Seattle Seahawks and San Diego Chargers have not. It’s worth noting that the Giants are reliant on pressuring the quarterback in order to stop the opponent’s passing game because, in situations when they don’t bring pressure, they allow a QBR of 80.4, the fifth-worst mark in the league. The team that has allowed the highest QBR when putting pressure on the quarterback is the St. Louis Rams (38.6). The Rams are also pressuring the quarterback at one of the highest rates in the league. The problem appears to be that the four-man rush which the Rams use so often takes a very long time to generate pressure. We track how much time opponents have to throw when a team gets pressure and when they don’t. In both of those situations, the Rams’ defense ranks near the bottom of the league. For exclusive video, stories and blogs about quarterbacks from every level of competition, check out ESPN's "Year of the Quarterback" page.